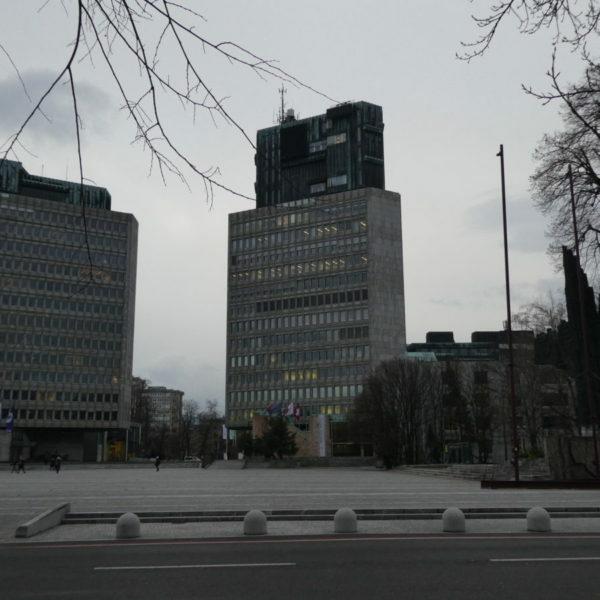 Prešeren Square is often called the living room of Ljubljana. So it was the perfect place to meet a stranger who would quickly become a friend. 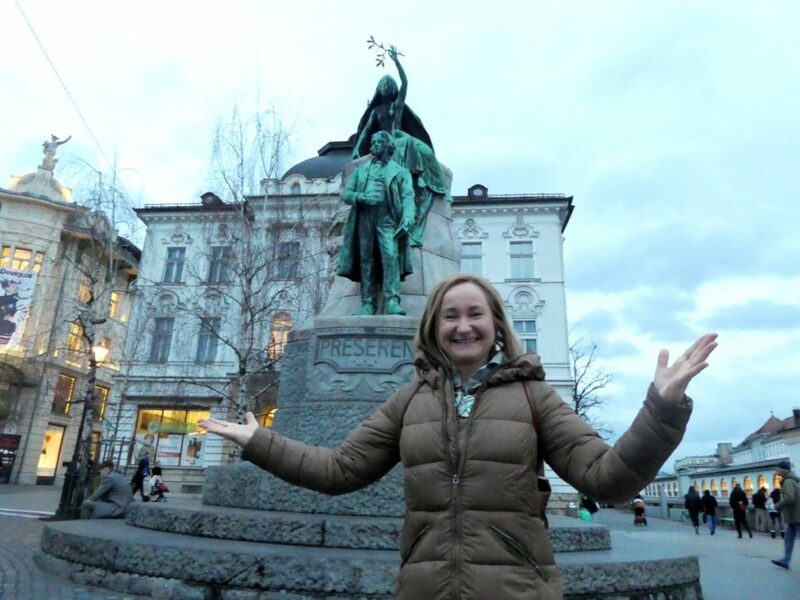 Fortunately for me, Mateja Kregar Gliha is also one of Slovenia’s leading tour guides. 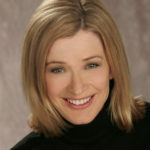 She is also the host of an English-language TV show for visitors, but more on that later. 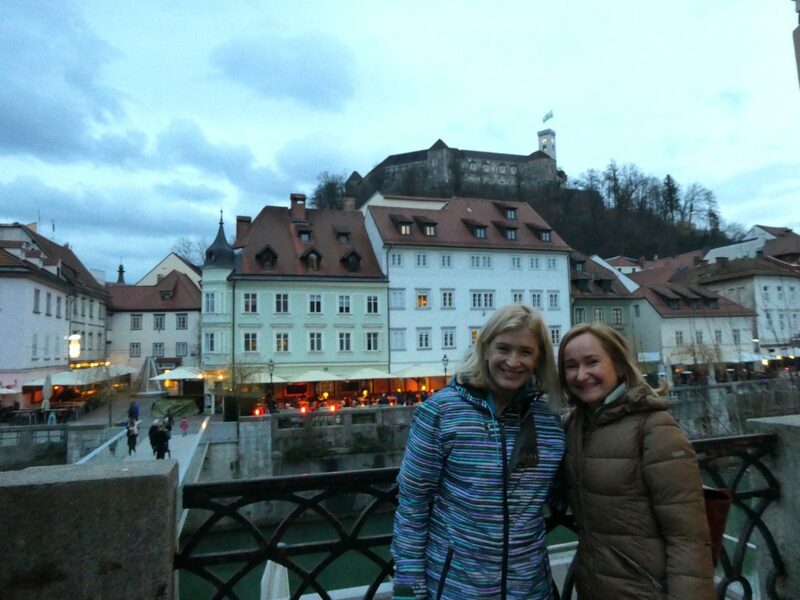 This was my fourth visit to Ljubljana but my first time touring one-on-one with an expert local guide. I figured I wouldn’t learn much about the city I didn’t already know. Wow, I was wrong! 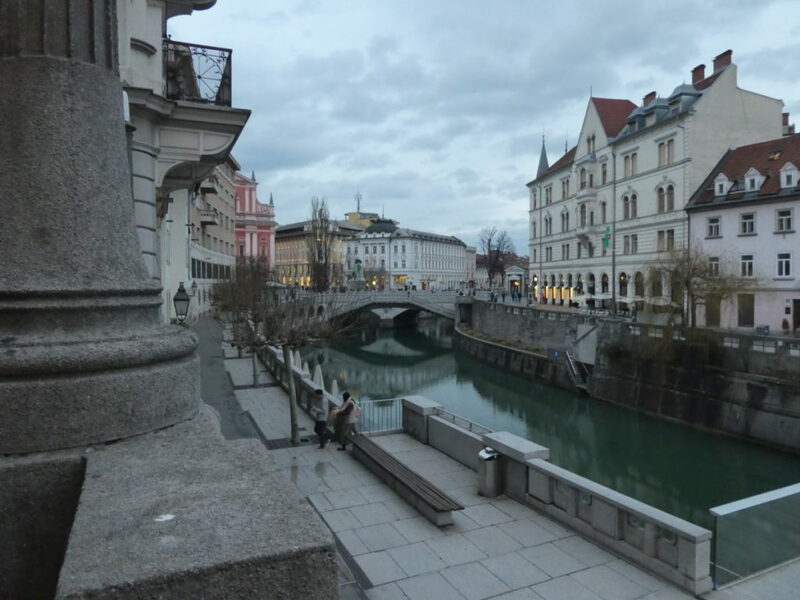 If you have only one day to see Ljubljana, spend it with a local guide. 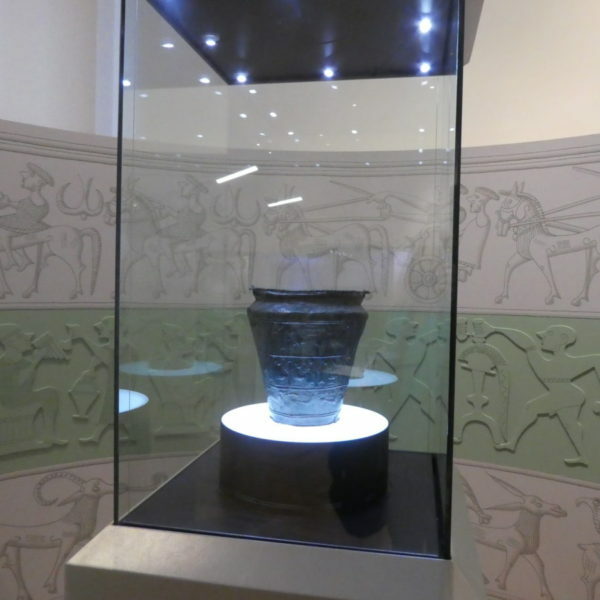 The first surprise was starting the tour in the National Museum of Slovenia. I had intentionally skipped it. Why start in a stuffy museum when you’re in one of Europe’s most walkable and scenic cities? Lots of reasons. 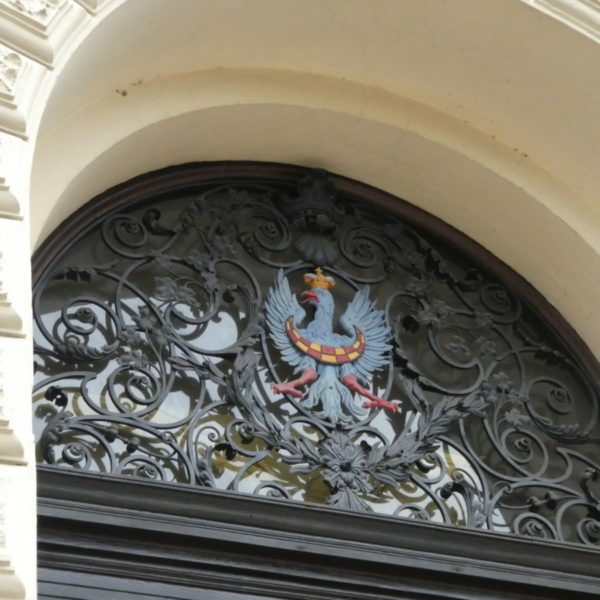 First, the building itself offers a history lesson on the legacy of the Austrian-Hungarian empire. 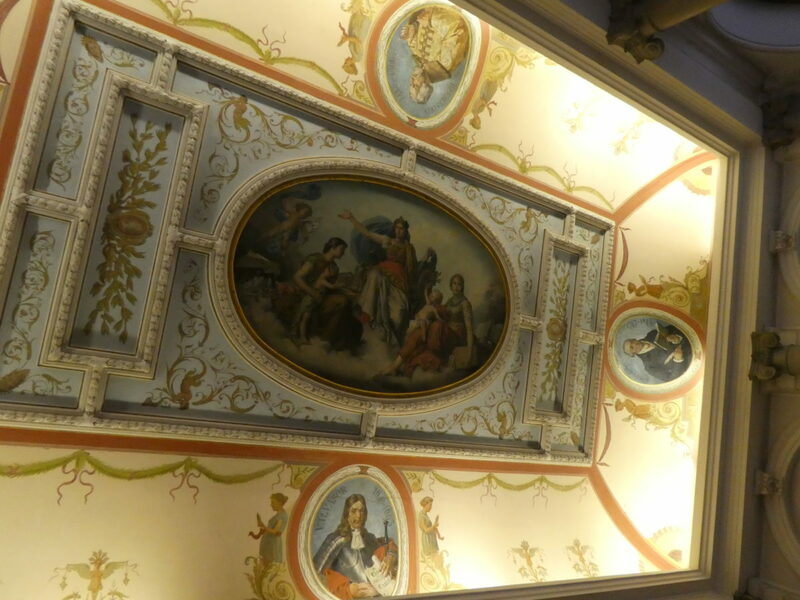 Splendid ceilings commemorate the scholars who made Slovenia possible by defining its history and language as separate from its Central Eastern European neighbors. 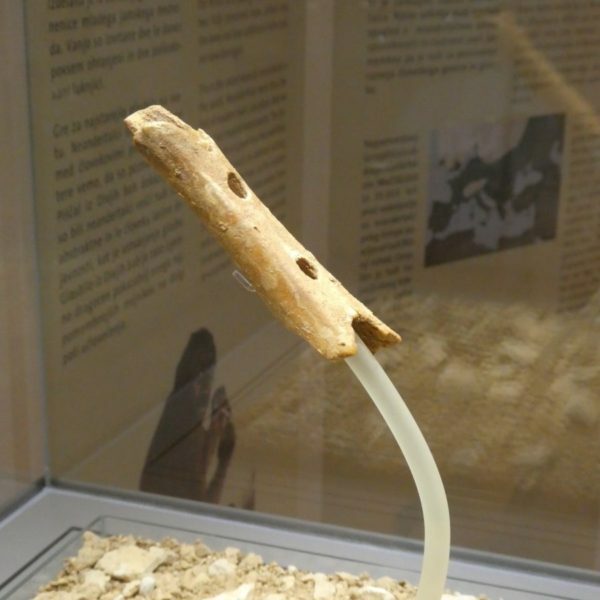 We walked through time, all the way back to the Neanderthals who fashioned the world’s oldest surviving musical instrument — a flute carved out of animal bone. Interactive exhibits make this a good stop for kids of all ages. 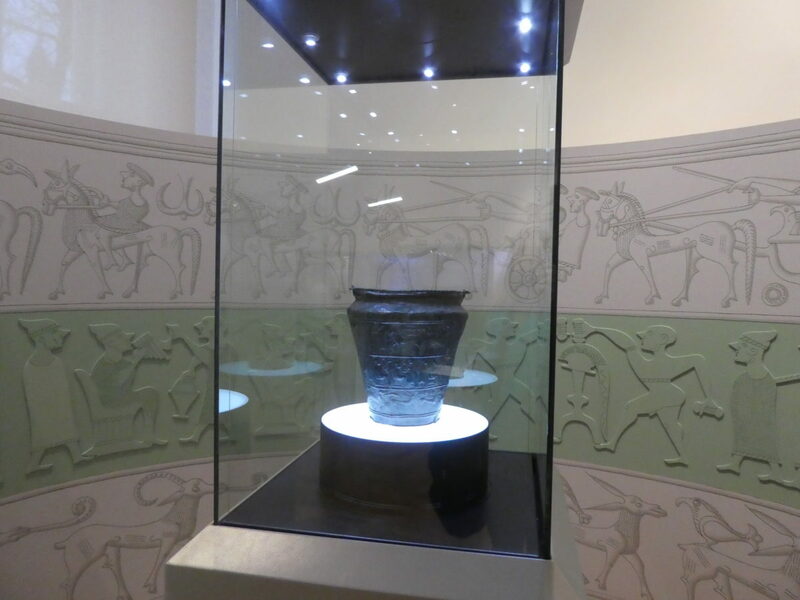 Visitors are encouraged to touch a replica of the Vače Situla, a drinking vessel from the 5th century BC showing the prehistoric figures prominently featured on Slovene passports and ID cards. 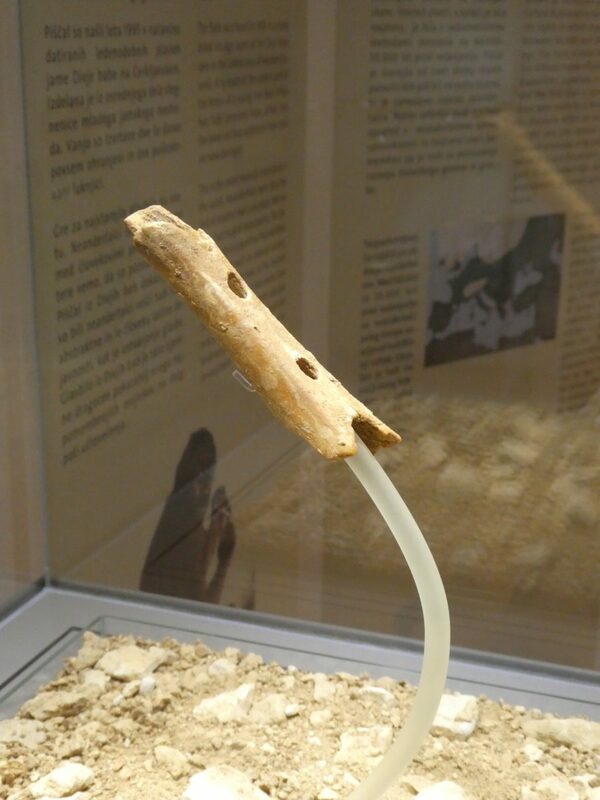 Next came the Romans and their city called Emona. 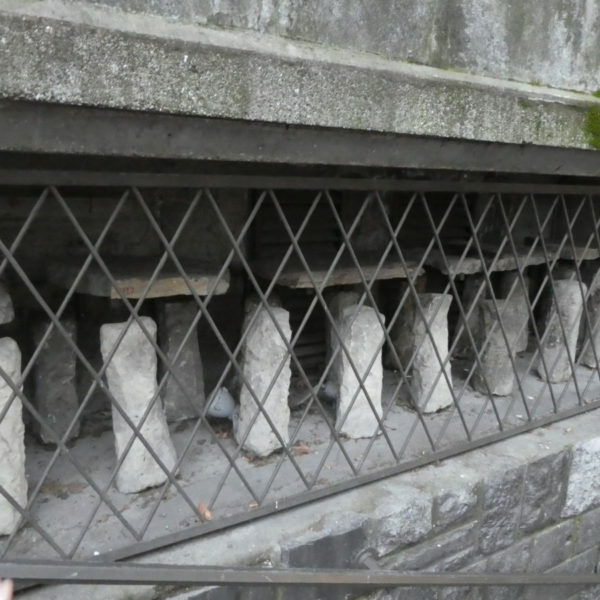 In the Middle Ages, residents of what would become Ljubljana needed to prove they had a useful skill in exchange for the privilege of citizenship within protective city walls. 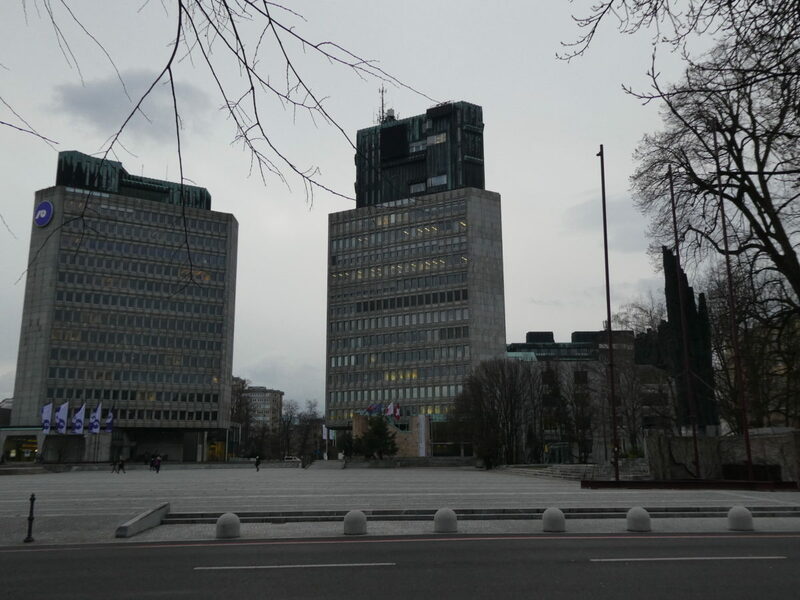 The next logical stop was the nearby parliament building, a modernist monument from the 1960s. 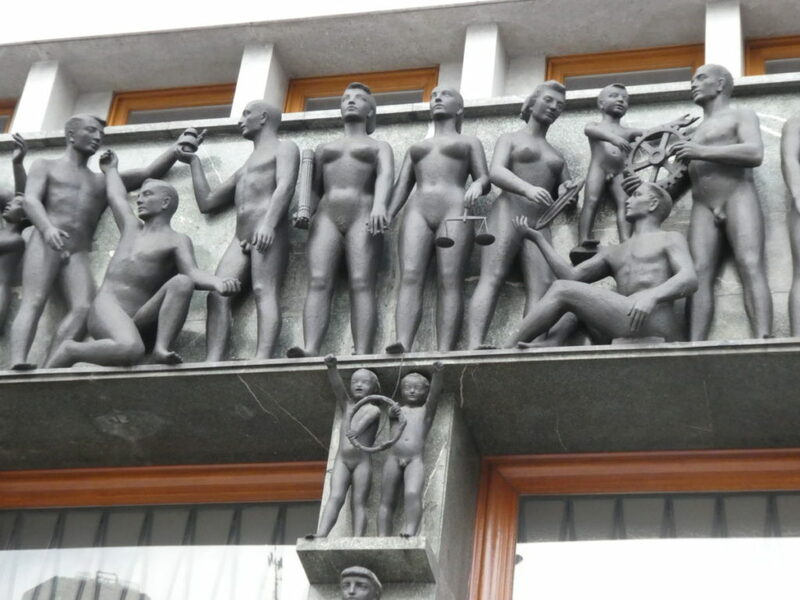 The entrance is framed by an astonishing sculpture of naked men, women and children. “We are born with nothing but our God-given talent,” Mateja explained, updating the Socialist imagery for the dynamic democracy that emerged in 1991 after the breakup of Yugoslavia. We are all born with only our God given talent. 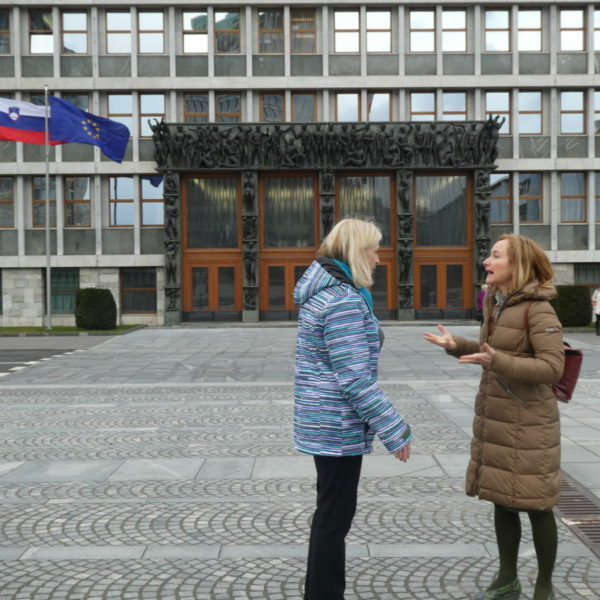 The political system has changed since the blocky skyscrapers were built across the square, but Ljubljana continues to benefit from its strategic location on the trade route between the Alps and the Adriatic Sea — as it has since prehistoric and Roman times. Slovenia has just begun to promote some of its hidden treasures. 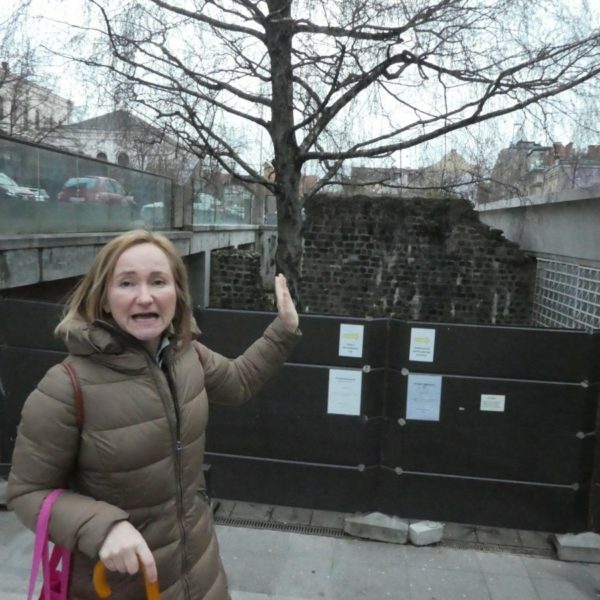 As we made our way through an underground pedestrian walk that leads to a parking garage, she pointed out ancient artifacts that I had managed to miss on all of my earlier trips — and are largely ignored by busy residents passing by. 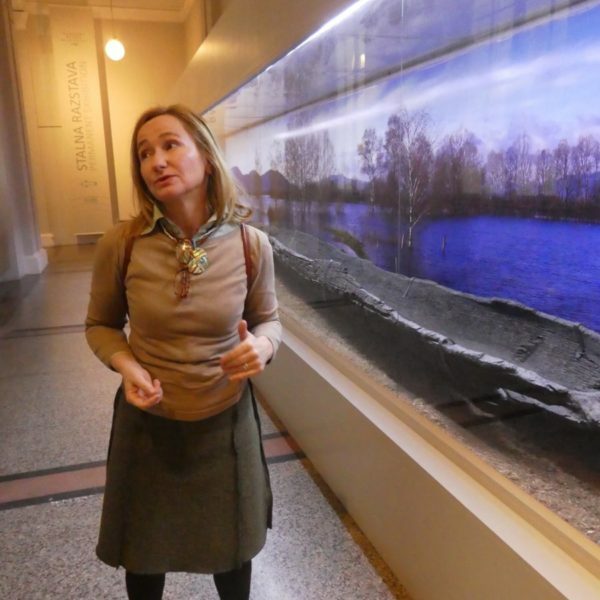 From here, Mateja customizes the walking tour to the interests of her guests. 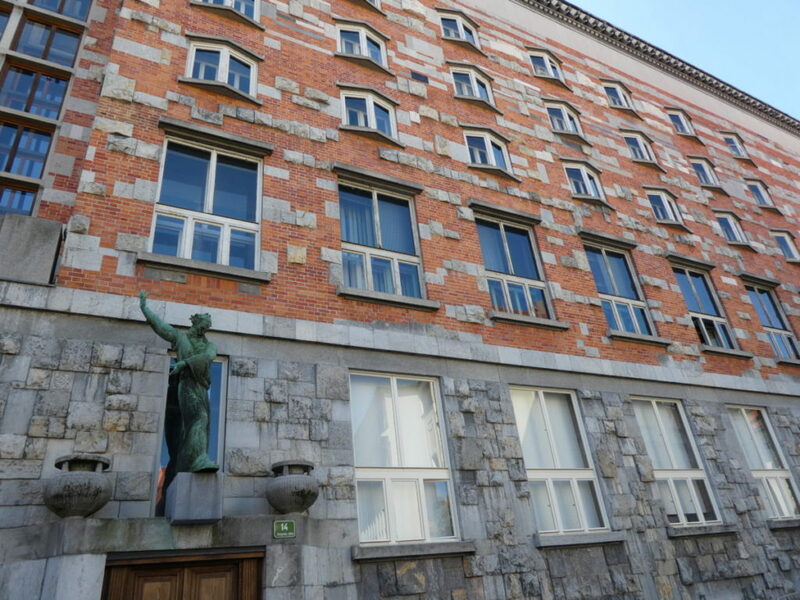 There is the influence of Jože Plečnik, the architect who directed the rebuilding of the city in the decades following a massive 1895 earthquake that left most of Ljubljana in ruins. The charming River Walk you see today, along with the Triple Bridge, the National Library and his Market Colonnade are all examples of his genius. Local guides know where to find the best photo ops of Plečnik’s triple bridge. 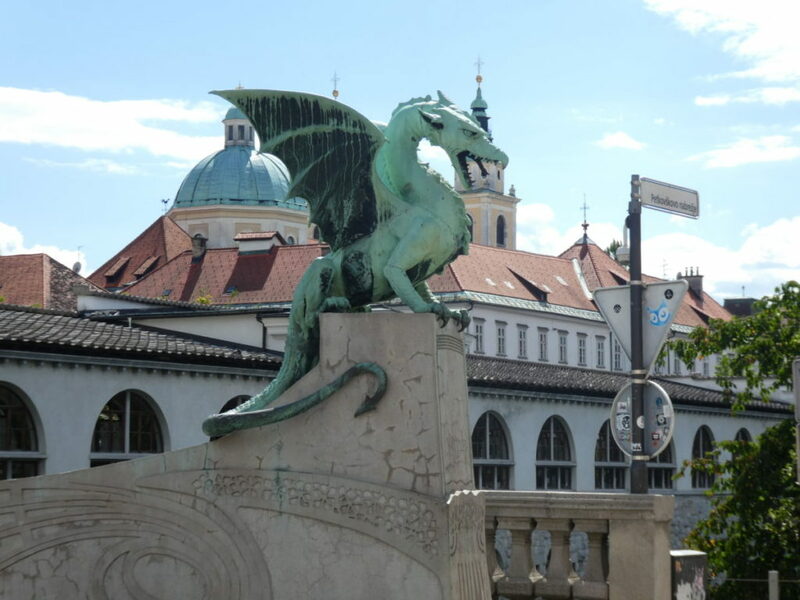 Ljubljana’s dragons stand guard near Plečnik’s marketplace. 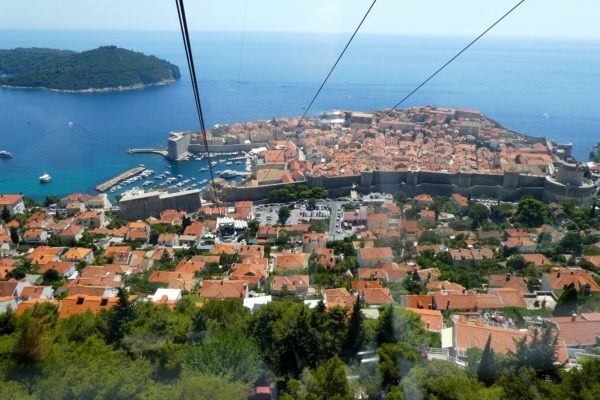 When choosing a lunch location, Mateja points out that local residents enjoy dining in the old city as much as tourists do. 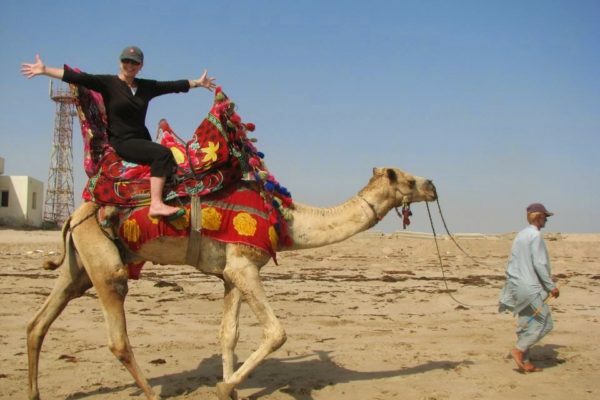 “There’s really no such thing as a tourist trap here,” she says. 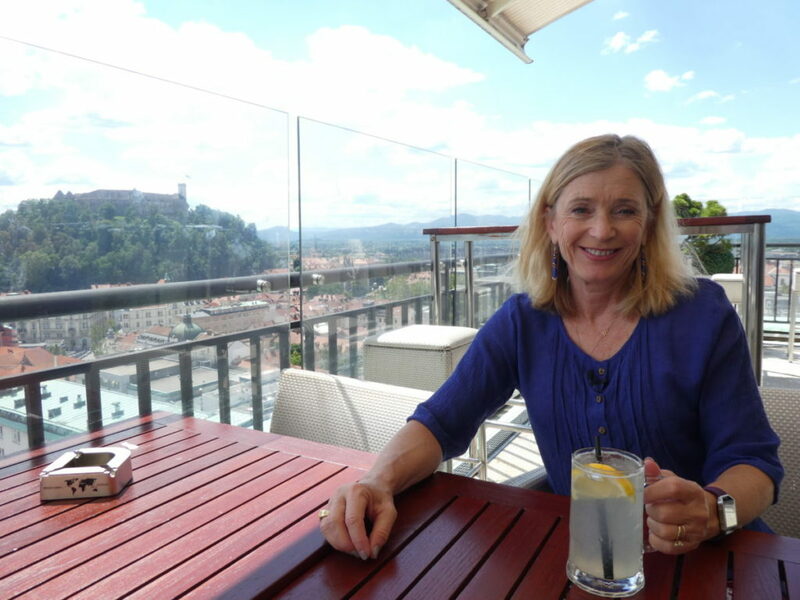 “Of course, you’ll pay more to eat in the center of any major city.” She has to deal with the different dietary preferences of her guests, but recommends Gostilna Sokol as a place that offers something for everyone, including traditional Slovenian dishes. The National Library, where Moses may be pointing the way to enlightenment — or the nearest bar. 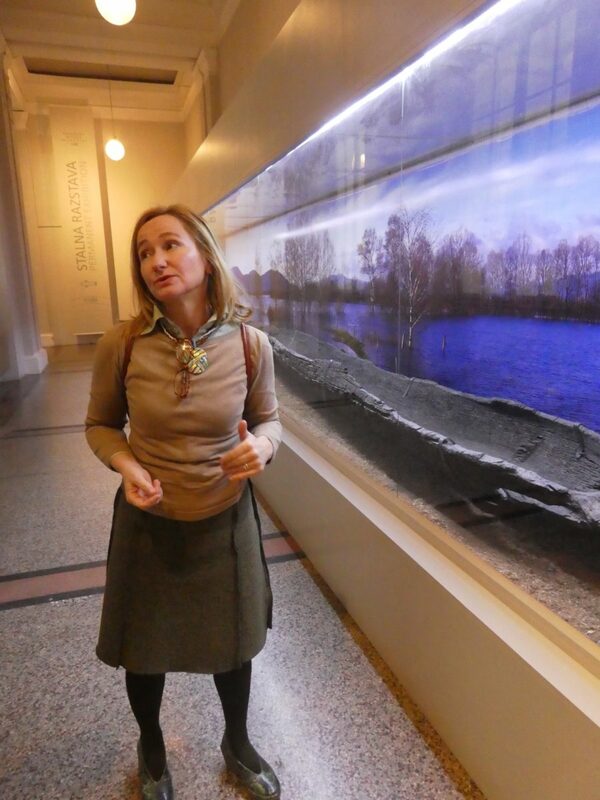 By mid afternoon, she says, most visitors may be feeling a bit overwhelmed with all the history. She recommends a relaxing boat ride on the river. Or she may guide them to the vintage 1933 skyscraper Nabotičnik, for a drink with one of Ljubljana’s best views. After an overload of history you’ll be ready for a cruise or a drink! Nbotičnik 1933 skyscraper is a great choice with a view. Back in Prešeren Square, Mateja wasn’t done surprising me in a city I thought I knew pretty well. Of course I had heard the story of Slovenia’s hero poet, France Prešeren, and his unrequited love for his muse, Julija. 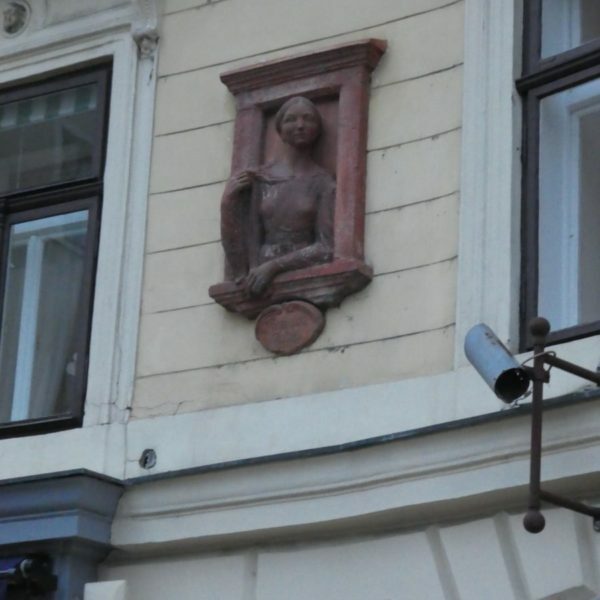 A likeness of the young girl is strategically placed on a building across from his statue in Prešeren Square. However, few people know there is a second Julia — concealed in an alleyway behind a locked gate. 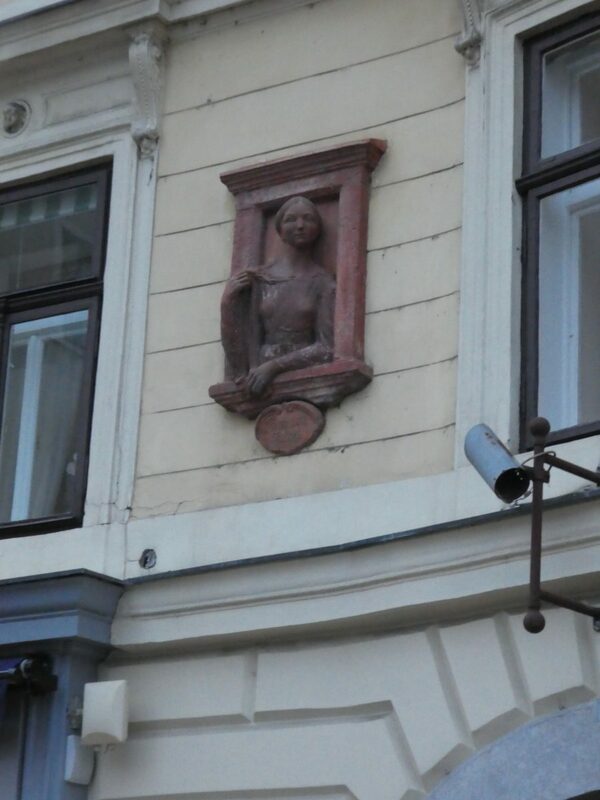 Apparently the sculptor’s first attempt was considered to be a mistake! 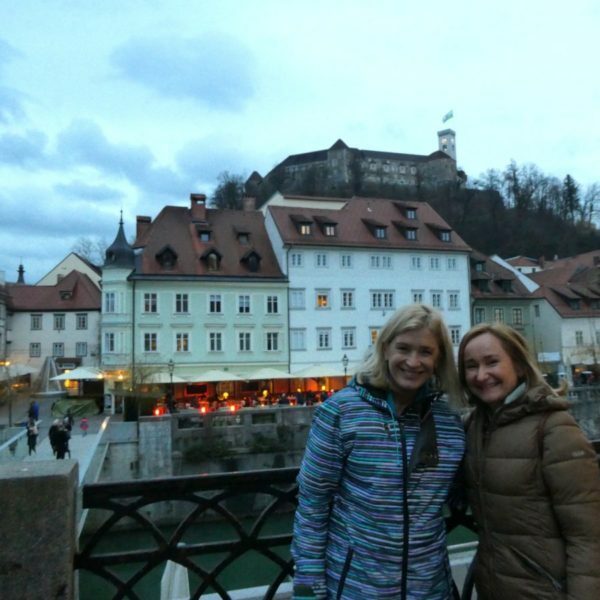 The biggest lesson I learned was the value of seeing Ljubljana through the eyes of an expert local guide. I had wandered around with my guidebook and joined a couple of generic group tours over the years, but my afternoon with Mateja made me love this city even more. If you have only one day to spend here, she’ll make sure it’s time well spent. 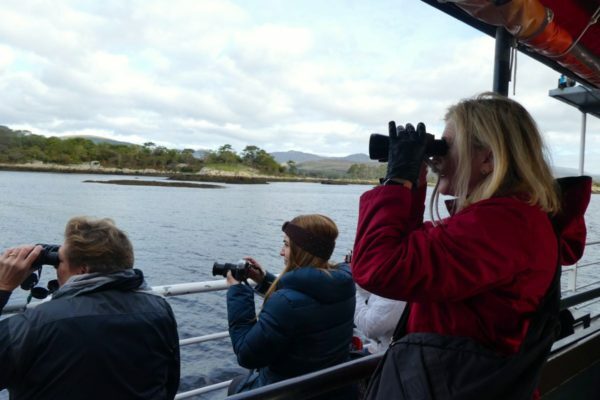 Contact Mateja on her website to arrange your own tour. 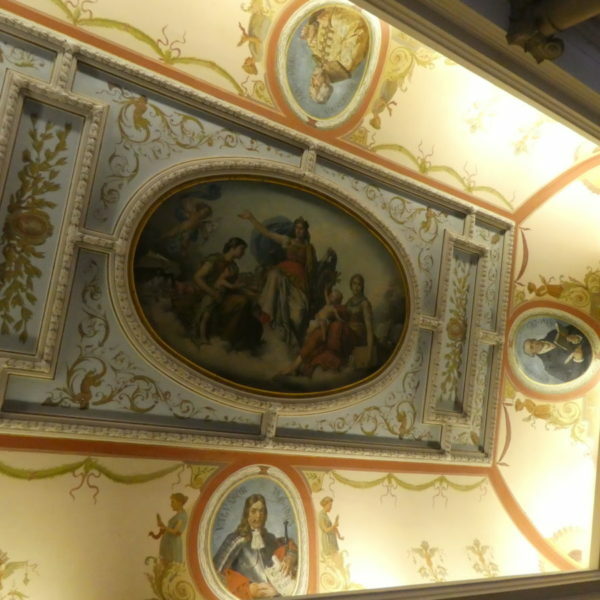 Antiq Palace Spa: A palace from 18th century. 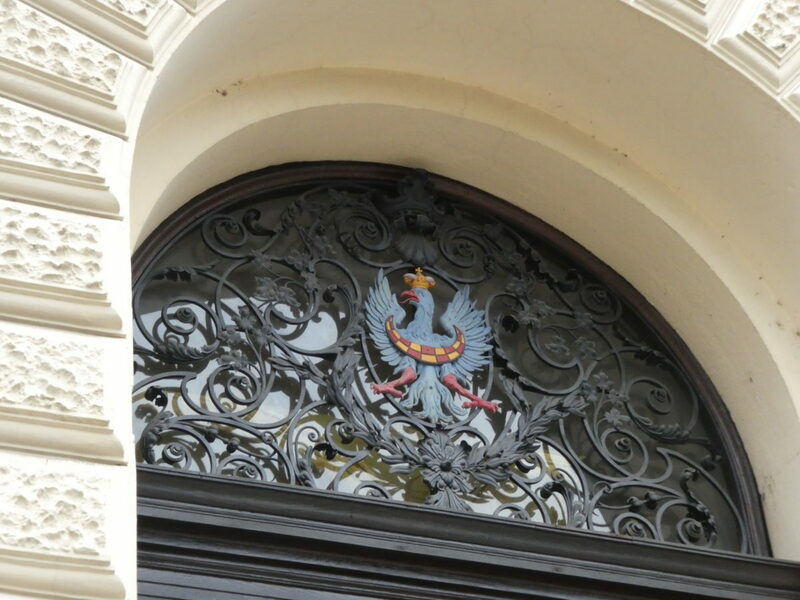 Grand Union Executive Hotel: Classic Art Nouveau in the heart of the old city. Urban Hotel: More modern with bigger rooms. And of course, there’s always the Airbnb, which Ljubljana has embraced. Click here to get started on your first booking with a 30 euro discount! Ljubljana is always a magical city, but it has understandably become one of the hottest destinations for travelers in July and August. Avoid those months if you want to skip the crowds and experience the city like a local. For more reasons to fall in love with Ljubljana and the rest of Slovenia, check out my video on The Voyage Report. 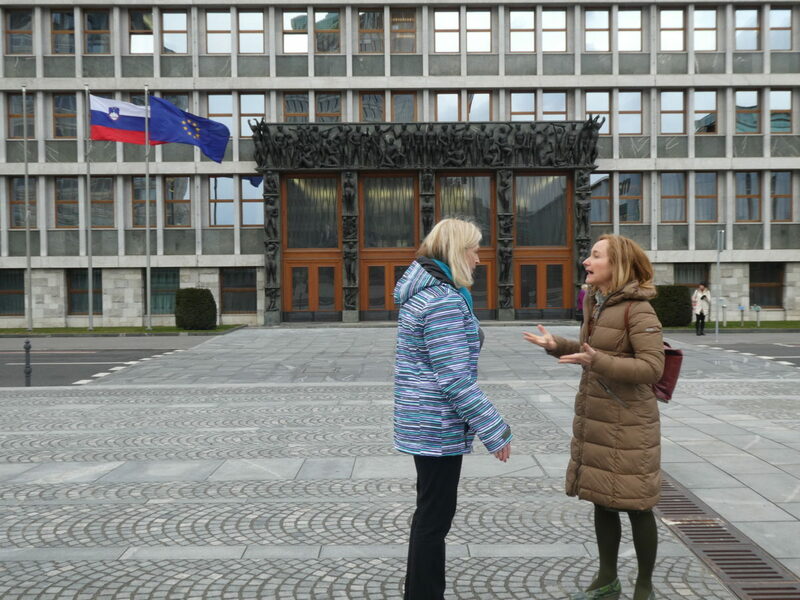 Mateja is also the host of a local TV show for visitors in English, Ljubljana 4 U. She invited me to be a guest. Here is the link to watch the segment. 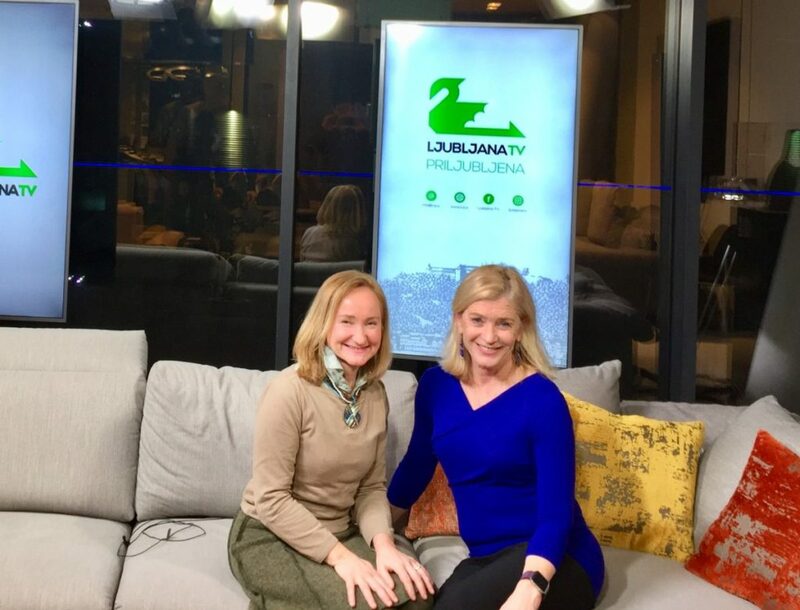 The program is a labor of love by the tour guides’ association and the folks at the local community channel. 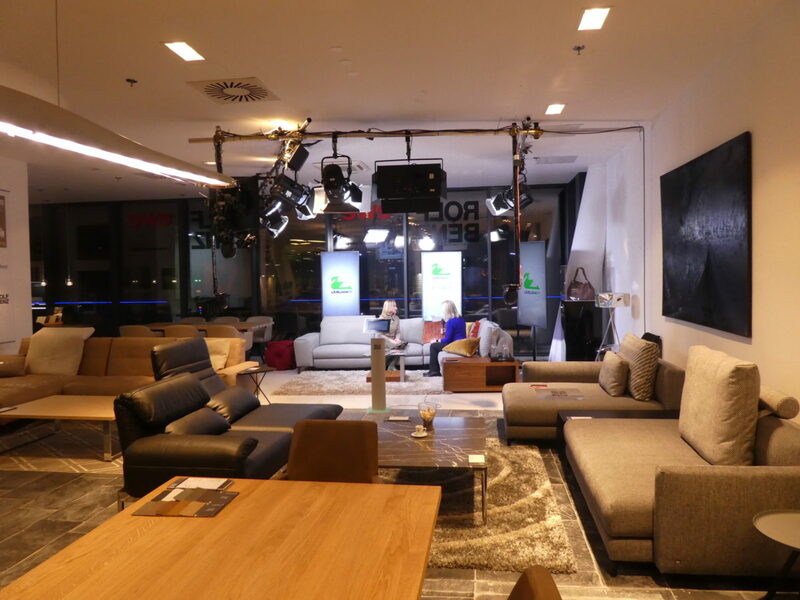 They have even transformed the neighboring furniture store into a makeshift studio. 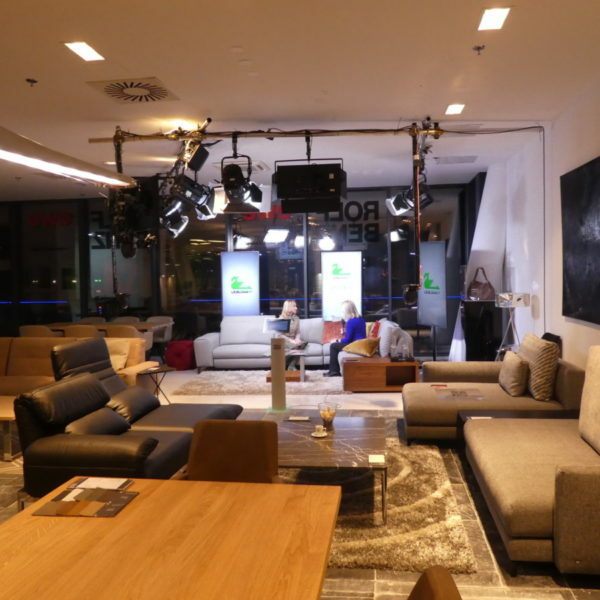 And yes, the couch where they do the show is for sale. Thanks for a great day, Mateja!